Security services patrol the boarded up Christmas stalls. Stalls are shuttered and the handful of people wandering about appear shell-shocked, talking in hushed tones of the previous night's horrific events. It's odd to see the market boarded up and empty when it should be full of life and of people celebrating. Instead of fairy lights, many stalls have red memorial candles used at grave sites on their front counter. The front of one of the closed stalls has been turned into a notice board for messages of condolence and support. "We stand together, we share the grief of victims and their families," a note reads in German and English. Other messages express a sense of togetherness: "Our words are stronger," "no fear" and "words are stronger than weapons." 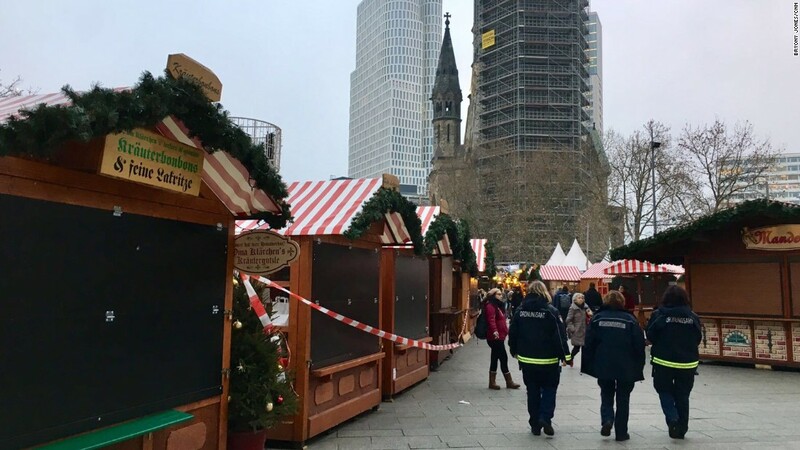 Just hours earlier, a truck plowed through the now-deserted Christmas market at Breitscheidplatz, in the western part of central Berlin, killing 12 people and injuring dozens more. As German authorities work to confirm the identity of the attacker, Berliners converge at the nearby Kaiser Wilhelm Memorial Church to pay their respects to the victims.